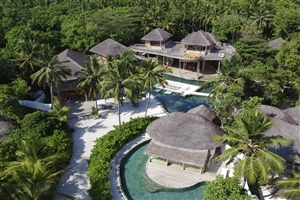 Nestled amongst the unfettered splendour of Kunfunadhoo Island in the Baa Atoll, Soneva Fushi is an inspirational getaway that brings world-class facilities and services together to make a truly intimate and tropical setting. Designed with Robinson Crusoe-esque tones, the resort's nature-inspired architecture and designs sets the tone for a magical experience that romantic couples and adventuring families can all enjoy. Hosting 61 private villas, a myriad of in-house dining venues and a world of soothing facilities, this is one Maldivian paradise to remember. 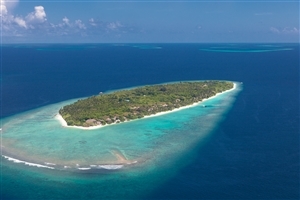 Looking out over the azure waters of the Baa Atoll in the heart of the Maldives, Soneva Fushi sits, embraced by the verdant nature of Kunfunadhoo Island, and serves as a tropical retreat for families and couples alike. 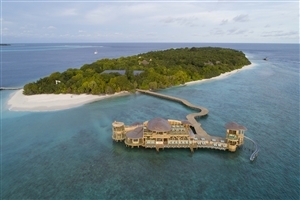 Easily reached by seaplane or speedboat, the resort is the ideal escape for those looking to unwind in luxury, with everything from soothing spa treatments, overwater eateries and 61 plush-filled accommodations awaiting you. The Crusoe Villa offers guests 235sqm of accommodation space inspired by the Robinson Crusoe castaway experience. 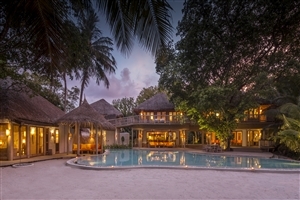 The villa features a rope-tied gangway, a tropical terrace and provides direct access to the beach. 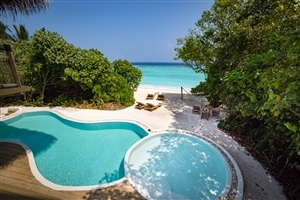 The Soneva Fushi Villa offers guests 235sqm of accommodation space intricately designed with tropical hues and tones and surrounded by exotic splendour. The villa features a living area, dressing room, open-air garden and provides direct access to the beach. The Crusoe Villa with Pool offers guests 395sqm of accommodation space inspired by the Robinson Crusoe castaway experience. The villa features a living area, a dining table, a terrace and a private pool. 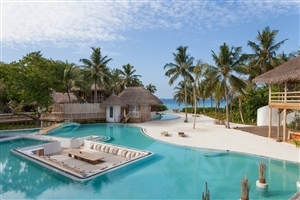 The Soneva Fushi Villa Suite with Pool offers guests 594sqm of accommodation space intricately designed with tropical hues and tones and surrounded by exotic splendour. The villa features a living area, a private pool and an outdoor garden bathroom. 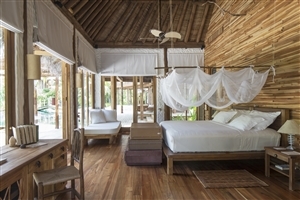 The Soneva Fushi Family Villa Suite offers guests 634sqm of accommodation space fully fitted to ensure total comfort for travelling families. The villa features a separate children's room, an observation deck, a living area, an outside sitting space and is situated a few steps from the sea. The Soneva Fushi Family Villa Suite with Pool offers guests 634sqm of accommodation space fully fitted to ensure total comfort for travelling families. The villa features a separate children's room, an observation deck, a living area, a private pool, an outside sitting space and is situated a few steps from the sea. 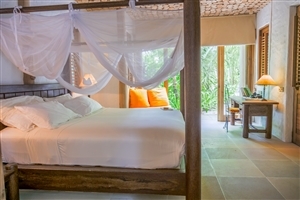 The Two Bedroom Crusoe Villa with Pool offers guests 649sqm of accommodation space designed with tropical elements and furnished with raw wood fittings, woven ropes and palm thatch. 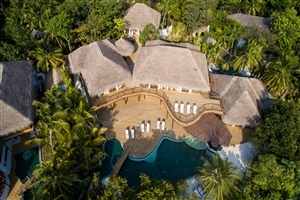 The villa features a separate children's room, an observation deck, a living area, a private pool, a dining space, an outdoor sitting space and provides direct access to the beach. Fresh in the Garden by Sobah – Enjoy a variety of home-grown ingredients while surrounded by tropical banana trees. 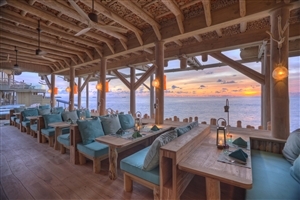 Dine Around the Baa Atoll – Experience delicious cuisines around the Baa Atoll on dedicated nights. 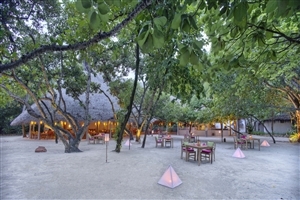 Sobah's Restaurant – Sample the fine flavours of modern Maldivian dishes on a secluded, uninhabited island. Mihiree Mitha – Select from a wide range of buffet delights such as baked goods, sushi, salads, pizzas and more. Out of the Blue – Dine on grilled meats, seafood, teppanyaki and sushi delicacies at this two-storey overwater structure. Once Upon a Table – Let your gourmet chef create a dining experience like no other for you at this culinary theatre. So Hands On – Revel in the fine flavours of expertly prepared seafood at this intimate eatery. So Bespoke – Tempt your palate with teppanyaki creations at this open-air venue. Nikki – Let Chef Nikki treat your tastebuds with modern-style sashimi, wagyu beef and other Japanese favourites. Chinese Kitchen – Flaming woks and open grills await you at this modern Chinese venue. Down to Earth – Eat, drink and be merry at this welcoming eatery where sharing food around nine different cooking methods is on the menu. Bar(a)bara – Settle back at this overwater bar located along the jetty with light bites and refreshing drinks. The Wine Cellar – Experience a private tasting from a selection of over 9,000 bottles at this underground wine cellar. So Guilty & So Cool – Treat yourself to handmade treats, ice-creams and sorbets at this chocolate parlour. So Delicate – Savour the tastes of gourmet hams and cold-cuts as well as distinct cheeses and preserves at this pre-dinner location.